OSWEGO, NY – November 2010 goes into the record books a bit warmer and quite a bit drier than average. The average temperature was 41.4 degrees. That is just 0.8-degree higher than average. Old Man Winter barely left a footprint in November. 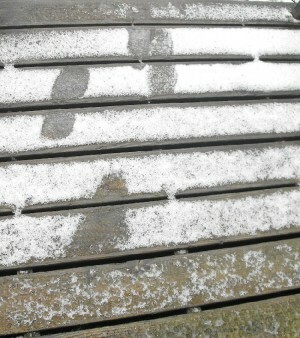 The first snowfall, on Nov. 27, was hardly measurable. It was, of course, followed up with nearly 9 inches on Dec. 3. The highest temperature was 64 degrees on the 14th and the lowest was 25 degrees on the 21st. The first frost was recorded on Nov. 2 and the first hard freeze arrived on Nov. 21. Precipitation for the month wound up at 2.62 inches. That is 1.85 inches below normal. Since the first of the year, precipitation is at 43.43. That is 4.30 inches above average. The greatest precipitation in a 24-hour period last month was 0.78-inch on the 17th. November had measurable precipitation of 16 days with consecutive runs of 5, 4 and 3 days. A trace of precipitation was recorded once. No precipitation fell on 12 days including a 6 days in a row period. Snowfall for November was only 0.7-inch. That is 8.4 inches below normal. The greatest snowfall in a 24-hour period was 0.6-inch on the 27th. At the end of November, snowfall for the winter season stood at 0.7-inch. That is 8.8 inches below average. Snow pellets fell on 1 day and ice pellets fell on 2 days. There were no thunderstorms last month, which is normal. There were no records set last month. November saw 1 foggy day, which is 1 above normal. The area saw 38 percent of the possible amount of sunshine. That is 14 percentages above normal. The number of cloudy days, 18, was 4 below average. The number of partly cloudy days, 10, was 4 above normal. The number of clear days, 2, was average. The highest barometric pressure was 30.52 on the 2nd and 21st. The lowest was 29.45 on the 5th. The strongest winds were at 65 mph from the west-northwest on the 17th, Gregway said, adding that was recorded at the college. The warmest November is 48.3 degrees (2001) and the coldest is 30.0 degrees (1933). The record high temperature in November is 78 degrees set on Nov. 1, 1950 and Nov. 7, 1938. The record low is -1 degrees on Nov. 30, 1875. The most precipitation to fall in a 24-hour period in November is 3.25 inches on Nov. 30, 1963. The wettest November on record is 9.03 inches in 1963. The driest is 0.45-inch in 1904. November 1976 holds the dubious title of snowiest – 36.9 inches. The most snowfall in a 24-hour period (14.0 inches) occurred in 1897. The only November to have no snow at all is 1966.